A liquid chelated zinc fertiliser for foliar application on all types of horticultural crops. 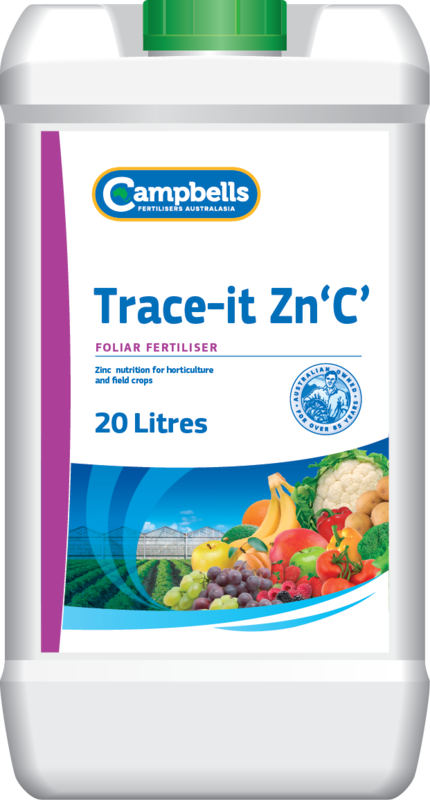 Campbells Trace-it Zn “C” is a chelated liquid fertiliser that is ideal for the correction or prevention of zinc deficiencies in many horticultural crops. Being chelate based, Trace-it Zn “C” is the quickest acting and most effective zinc fertiliser form, making it fully available to the plant for immediate foliar absorption. Zinc is required in small amounts, but is of high importance for quality fruit and vegetable crops. Zinc is involved in the production of hormones, which control the extension of roots, shoots and leaves and in flowering, pollination and fruit-set. The availability of zinc in soils can be reduced by cool wet soils, high levels of phosphorus, alkaline soil pH or competition from Cu, Fe or Mn. Deficiencies can result in poor flowering, stunted growth and interveinal chlorosis and/ or mottling of leaves. Trace-it Zn “C” foliar sprays are an effective means of rapidly improving the plants zinc nutritional status. Campbells Trace-it Zn “C” is recommended for foliar application. Recommended rates of application vary between 750 ml to 1 L/ha – specific rates will depend on the crop, stage of crop development and the zinc requirement. (Note: Zinc foliar sprays during early fruit development may cause russetting). Before application, seek advice from your Campbells Trace-it Zn “C” distributor or your local agronomist.